Martin on Dirt Magazine cover.. back to back! Martin gets back to back covers of Dirt Mountainbike Magazine! 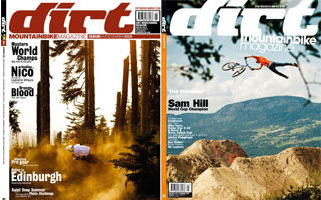 Dirt crew said that this is the first time one rider made it onto back to back covers. This epic photos were taken by one of the best MTB photographers - Mattias Fredriksson. The latest cover photo was taken during Deep Summer Photo Challenge in Whistler where 6 worlds best bike photographers were competing to win a $6,000 prize money. Mattias and team Scanada got the grand prize. The Novembers issue cover was taken in Norway during Anti Days of Thunder event. Congrats to Martin and Mattias!